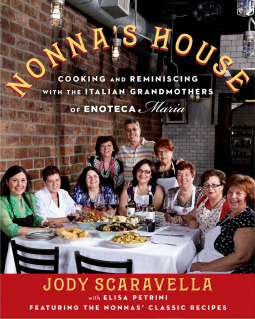 I got a chance to take a peek at an uncorrected proof of Nonna's House by Jody Scaravella, and the odd thing was that I think I enjoyed the stories in this book more than the recipes. And that's odd, because I'm usually all about the food. But the stories reminded me of what I've heard from my own (non-Italian) relatives about coming to America, so it got me thinking about those stories. There are a few recipes I want to try even though the book isn't finalized, but I might leave some of the others for the final version to see if a few questions get cleared up. For example, one recipe called for three anchovies, which in the US are tiny things that come in jars or tins, but I know that there are much larger anchovies that are pretty much of a meal. Based on the recipe, I'm pretty sure the larger anchovies are required, but I'm not sure exactly how large - and that's a pretty important consideration for me, considering that I'd probably end up substituting a fish that's more likely to be available where I live. The photos in the book look great, so this should be a very attractive book when it's done. It's due to be released on April 7, 2015 on Kindle. Note: I received an uncorrected digital version from the publisher at no cost to me.